"The Parnell Monument which stands at the top of Dublin's La Rambla (O'Connell St) is an almost 50 metre high triangular obelisk similar in prominence to the well known Columbus Monument at the bottom of La Rambla. Inscribed in its granite blocks is a quotation from a speech by the 19th Century 'Home Rule' leader Charles Stewart Parnell ('The uncrowned King of Ireland' as he was then called) in whose honour the Monument was erected over one hundred years ago. "No man has the right to fix the boundary to the march of a nation. No man has a right to say to his country: 'Thus far shalt thou go, and no further'; and we have never attempted to fix the ne plus ultra to the progress of Ireland's nationhood, and we never shall." 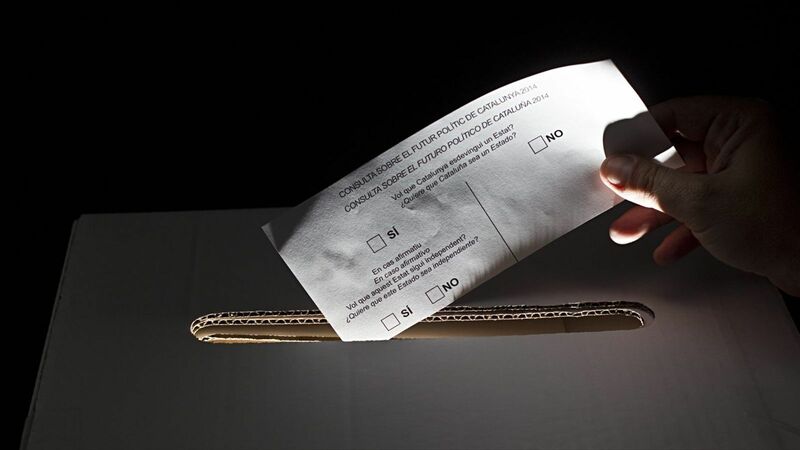 A week from today the people of Catalonia will try to exercise their right to vote on their own future. The right to vote is a basic human right that empowers citizens the world over to influence governmental decision-making and to safeguard their other human rights. The right to vote and the right to public participation in government are contained in Article 21 of the Universal Declaration of Human Rights. Self-determination denotes the legal right of people to decide their own destiny in the international order. At its core it is a right of 'all peoples'. There is of course no obligation upon a people to assert or demand self- determination but when they do so it is their right under international law and thereafter it is their right to be afforded the right to vote on that entitlement to self-determination. This to me is the core principle underpinning the call to 'Let Catalans Vote' and why I and others like Desmond Tutu and Adolfo Perez Esquivel are supporting that call. It is also why it should be supported by all democracy loving Spanish people who support the rule of international law. It appears to me that in preventing, or trying to prevent, the people of Catalonia from exercising their right to vote on whether they should have independence, or on what form that independence might take, the Spanish Government is trying to do what successive Britain Governments did to Ireland in the 19th Century. They are trying to set the 'ne plus ultra' to the aspiration of a people for independence and nationhood. All peoples, and that must self-evidently include the people of Catalonia; have the right of self-determination. The majority of the people may not ultimately choose to vote for independence – as was the recent case in Scotland - but that is not the point. That is not what is at stake here in terms of international law or in terms of respect for democracy. The fundamental point and principle is that a distinct people with its own history, language and culture, and a people who self-regard themselves as separate, and are entitled to do so, be given what the Scottish were given less than two months ago - the right to set the 'boundaries to the march of their own nationhood' in the words of Charles Stewart Parnell. The right to decide whether they wish to go it alone, or to remain part of the Kingdom of Spain - or a variation of one or the other. The people of Spain, and those of us outside Spain, can debate and have our own strong views as to the wisdom of independence for Catalonia and whether it is in the 'best interests' of Spain or Catalonia or the European Union. But again that is beside the point. The point is that it is the people of Catalonia who must decide. Ultimately the Spanish Government must realize (and have the confidence that they can win the hearts and minds of people in Catalonia - or not) that you cannot keep two peoples together if one of those people does not want ultimately to be governed by the other. The example of the Czech and Slovak Republics is a good one. The 'Velvet Divorce' of 1992 may have broken lots of Czech and Slovak hearts, including its then President and leader of the Velvet Revolution, Vaclav Havel, who wished the two parts of the country to remain as one. But the people of Slovakia decided that they wished to go it alone and their Czech neighbours respected that decision and the will of the Slovak people. Catalonia deserves no different treatment. Let Catalonia Vote and let the people of Catalonia decide."